Admit it. When you saw that this week’s episode of The Walking Dead was entitled “Consumed”, you were pretty certain one of our favorite characters was going to get… well… consumed. Though things are never that cut and dry in The Walking Dead as we find that in this new world, everyone runs the risk of being consumed whether it be by walkers or by the severity of their situations. Operation Rescue Beth is underway and our favorite archer/badass duo just found some unexpected help along the way – but will it be enough? Throughout the episode, we constantly saw flashbacks of Carol’s past during the time of the show. We see how hard she took it when Rick abandoned her and how she is drawn back to the group when she sees smoke coming from the Prison. Though each of her other flashbacks have a very different sense. In each of the following flashbacks we see Carol losing more and more of herself as she tries to do good. Whether burning Karen’s diseased body, burying Lizzie’s body – after firing on her – and setting all of Terminus up in flames, we see how more and more of Carol is ‘consumed’ by this new world while trying to save others. At the start of the episode we see Carol about to possibly leave and even halfway through the episode she doesn’t known if she’d have left or not. She tells us how in this new world, we burn off pieces of our former self; and we are reminded through the flashbacks how everything that Carol done for the good of the group has also burned her in the process. Though while it is Carol we see ‘doing the burning’ in the flashbacks, it is Darryl who takes this role in the present. While in the temporary housing, Carol and Darryl meet a ‘mother and daughter’ walker trying to get in – which immediately bring up memories of Sofia. Though when Darryl tells her she doesn’t have to and then kills them and burns the bodies himself, it is a direct juxtaposition to the flashback we just saw with Carol burying Lizzie. In the flashback, Carol basically had to do everything from putting Lizzie down to dealing with the body. In the present, it is Darryl who does this. In fact, every fire started in the present episode was caused by Darryl while the fires in the flashbacks were either caused or seen by Carol. Though in keeping with Carol’s idea of ‘being consumed’, we also get hints at how Darryl has changed over the seasons. We know that he went from Merle’s tagalong to being a softer – yet still ridiculously badass – character; but there’s been much more conversion than just that. One of the books Darryl took with him was about dealing with child abuse. This reminds us of how he was beaten up as a kid and even suffered with Merle a bit too; but he’s learned to put it behind him and burn off the pain thanks to Beth especially – but also to Rick and all the others. By episode’s end he might seem harsher; but it’s actually all an act to remind Carol of the good still inside her. As Darryl and Carol are in pursuit of Beth’s kidnappers, Carol has serious reservations about the plausibility of this rescue mission. Sure Darryl’s taken precautions to knock out the car lights so they can follow stealthily; but Carol doesn’t know why he doesn’t just run them off the road. Darryl’s method might not be as quick as Carol’s, but it’s certainly more thought out to cause a happy ending. Though does Carol believe in happy endings anymore? As I was saying earlier, Carol knows that every time she tried to do something ‘good’ for the group, all that happened was her getting burned. Sure she rescued them all from Terminus, but she’s afraid her yet to be brought up past will sway their opinions once more. She used to be the person who never fought but has now evolved into the person who can – but is that enough? Darryl knows she is still thinking about giving up and leaving after all is said and done, so he has to find a way to remind her about the ‘good’ in her. Thankfully Noah was the person to do this. Let’s be honest, if this was our first meeting with Noah, we’d have hated his guts. Though thankfully we know him as the kid who was kind to Beth and tried to help her escape. Everything he’s doing now is for Beth and to help her escape; so we don’t mind when he steals from Darryl and Carol and then releases a walker on them. Of course our heroes don’t know this at the time, which makes Darryl saving his life all the more “good”. Noah’s still just a kid who honestly doest want bloodshed. He’d have killed them otherwise. So later in the episode when Noah life is threatened again, Darryl reasons that he’s already saved the kid once. He won’t do it again. It takes Carol begging Darryl for his help in saving him; or did it? When it looked like Darryl was leaving and Carol was a bout to beg for one final time, he was actually aiming. Darryl was going to save the kid yet again but just wanted Carol to realize it. If Carol – the woman who earlier noted “I don’t think we get to save people anymore” – could beg for this kid’s life, then she’d realize you can still be good and save people. This would restore her hope and burn away the ashes that have accumulated from her past few encounters – thus making Carol decide to stay with Rick and the group. Dawn and the people at the Hospital might have underestimated Noah, but Darryl and Carol won’t. Much like Rick and the rest of the group, he is very much like Season 1 Shane. He knows some people have to die; but he still balances it with his care and concern for friends. Though with Carol’s injuries from the fall slowly getting to her, she needs help – and that’s when the worst happens. Whether by accident or on purpose, the cops runners for the hospital plow right into Carol. Once again, this makes us wonder if they really are ‘saving’ people or just injuring them so they can be taken in easier. Though Noah realizes that Carol’s best bet is to be taken and saved with their medicine and tools. In order for Darryl and Noah to save them, they’ll need bigger guns and a lot of them. Thankfully, Darryl has them and small army back at the church, which means that Noah is the one with Darryl back in the woods. Due to how this season has been playing with time a bit, it’s safe to assume that Abraham and his group haven’t made it back to the church yet. 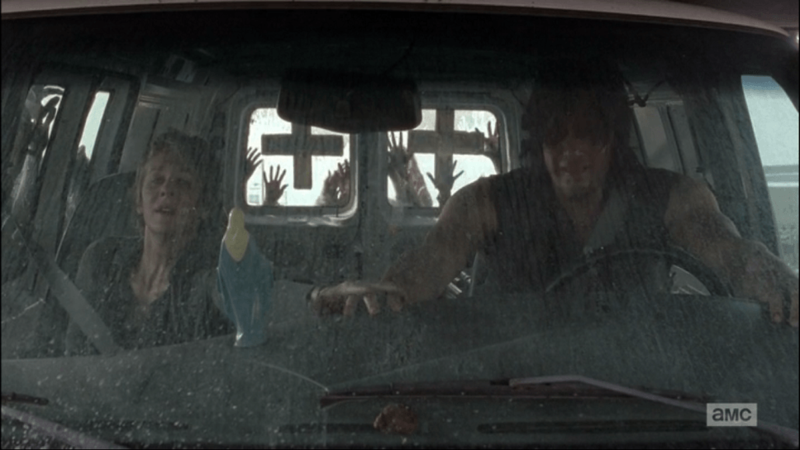 So who will head into the city with Darryl and Noah? 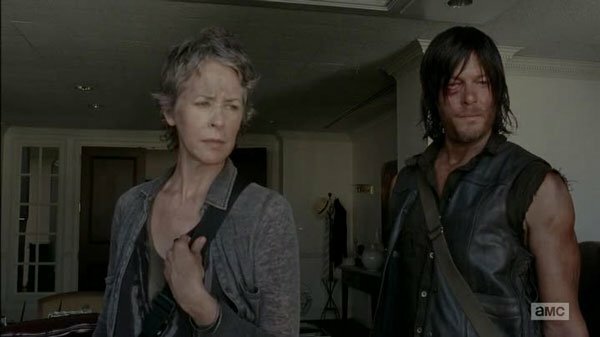 Will they be in time to save Beth and Carol? Also, will Noah’s original group of survivors ever be referenced again? Could his group be the Alexandria Safe Zone of the comics? We’ll find out soon as there are only two more episodes until the midseason finale.